In the North-Eastern corner of the rugged Isle of Islay, in spitting’s distance from Jura, lies a solitary, isolated distillery. Indeed, it is so close to the sea that the stillmen watch seals whilst on their shift. Its name: Caol Ila. One of few distilleries in Scotland to have been in near enough constant production. Only the Great Depression and World War Two have stopped Caol Ila from producing their smoky, briny whisky. The distillery still produces 95% of their spirit for use in blends, providing much of the peaty kick in the world’s best-selling Scotch; Johnnie Walker Black Label. Luckily, 5% does reach the market as a Single Malt, and the clean grassy peat, and light body saw this whisky deemed a "wonderful Aperitif" by the late, great Michael Jackson. Recent years have seen the distillery experiment with unpeated releases, affectionately named "Highland in Islay". Up until 1972 Caol Ila had its own floor maltings, until it demolished and rebuilt the distillery, a process that concluded in 1974. Now, like many of its fellow Islay distilleries, Caol Ila sources its barley from the Port Ellen maltings. Long term Caol Ila fans claim that there is a difference between the earlier, heavier expressions, and the lighter, olive-oil like expressions that followed this rebuild. The Port Ellen malt is the standard Optic barley peated to around 35 ppm. This barley is run through a Porteous mill from the late 50s, before transfer to a single cast iron Lauter mash tun, 11.5 tonnes at a time. Here it meets with water drawn from the nearby Loch nam Ban three times at increasing temperatures from 68-79 Co. Once mashed the mix goes into 8 washbacks of Oregon pine, Mauri strain yeast is added and the mix heated to 16Co. The fermentation goes on for around 80 hours during the week, and 120 during the weekend. Once the beer is around 8%ABV it’s pumped to the stills. As noted above, the distillery was completely rebuilt in the early 70s, though they were exact replicas of the old pre-rebuild stills. The stills themselves (as everything else in Caol Ila seems to be) are industry standard onion pot stills, and there are three each of wash (7m tall) and spirit (6.1m tall), with a respective capacity of 35000+ litres per still and 29000+ litres per still. The low wine run takes about 4 hours, heated by steam pans, and producing a spirit still charge of circa 28%ABV. Foreshots are run for around 30 minutes before the spirit run of 2 to 3 hours, followed by a feint run of a similar time. The cut is taken from 75-65%ABV. After this the 63% spirit is matured in overwhelming first and second fill American oak hogsheads and ex- bourbon barrels, though there are sherry cask independent bottlings that suggest that at least some of their spirit is sherried. Of course, the Distiller’s Edition is finished in Moscatel wine casks. Other than this slight variation here, everything about Caol Ila seems to be industry standard on a very large scale. Who knew great whisky could be so straightforward? Just as the production of the whisky is fairly unremarkable, the history of the distillery is too. It was founded in 1846 by Hector Henderson, the best named man in whisky, who also owned a distillery called Camlachie in Glasgow, which sadly closed in 1920. Other than this there are precious few events of notice since then, though moments of interest occurred when the distillery closed in the 1930s due to the Depression, and during World War Two, and the rebuild of the 70s. On the other hand, commercial highlights were the release of the semi-official Flora and Fauna in the late 80s and the official bottlings at 2002. In 2005 Caol Ila joined Diageo’s collection of "Classic Malts". Ownership history is, as with all distilleries, convoluted. Henderson owned the distillery up until 1854. Norman Buchanan then owned it until 1879, before Bulloch, Lade & Co. took over. In 1920 the distillery was sold to J. P. O’Brien Ltd, who immediately passed it on to the Caol Ila Co. In 1927, then drinks giants Distillers Company Limited took over, transferring the distillery to Scottish Malt Distillers a mere three years later. It then fell silent. Later in the century, United Distillers (who later evolved into Diageo) added the distillery to their portfolio in 1986. 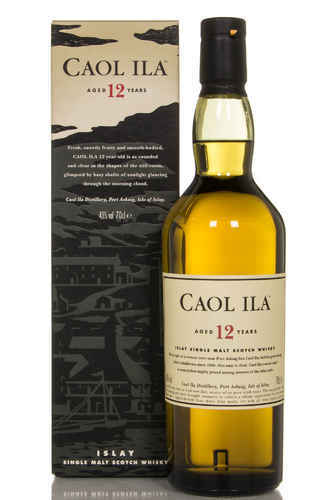 Caol Ila 12 is the entry-level malt, accompanying the 18 year old, 25 year old, and the lighter NAS Moch. The Distiller’s Edition is 12 year old, finished in Moscatel wine cask, released once a year. There is then the unpeated range, which is a stalwart of the Diageo Special Releases, and often on the cheaper side of the yearly selection. There are some extremely old Caol Ila’s available, and the unpeated expressions are interesting to see from a typically smoky distillery, and certainly worth picking up for a fair price. However, such is the prolific nature of the Caol Ila, there are many excellent quality, old, Independent Bottlings from the likes of Douglas Laing, Cadenheads and Carn Mor available. Caol Ila is by far the largest distillery on Islay, producing 4 million litres of pure alcohol a year. Thus, they outstrip some of the biggest brand distilleries on the island, and indeed, in Scotland. There is no young Caol Ila maturing on Islay. Despite their large warehouse, they only keep their very old stock here, shipping everything else to the mainland. 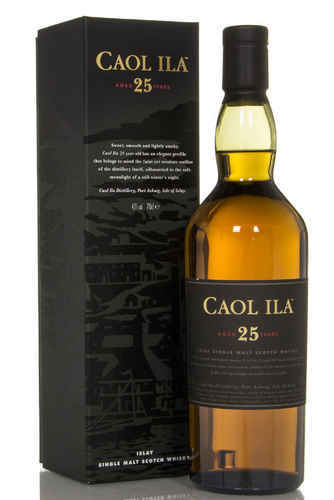 Alongside JW Black Label, Caol Ila features in other well known, and well-loved blends such as Black Bottle and Bell’s.